The Solaer® solar aeration system is one of the most complete pond & lake aeration systems available in the world. The patented Solaer® system provides a comprehensive solution for all aspects of pond aeration as well as lake aeration. By aerating lakes and ponds using solar energy, clean and healthy water is constantly renewed using the free energy provided by the sun. The superior Solaer® system allows you to implement a one-of-a-kind system, powered by the sun, which needs virtually no maintenance. The Solaer® system is a one-of-a-kind solar aeration system that was developed by Keeton Industries as an alternative to grid powered aeration (usually fossil fuel). 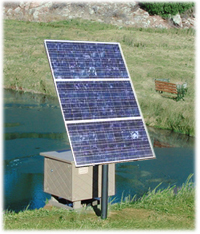 Solar aerators are great for both remote installations and environmentally conscience applications. They are for aquatic environments ranging in size from small ornamental ponds to lakes up to 4 acres. Solar pond aerators pay for themselves with time, resulting in an unbelievable cost savings over grid-powered aeration systems. Plus, unlike grid-powered systems, you won't have to worry about power outages reeking havoc on your aquatic habitat. These fully automatic systems are designed to run up to 20 hours per day under standard operating conditions. The battery backup system allows them to run like normal under less-than-optimal conditions. Built for both hot and cold climates, no climate is too harsh for our Solaer aeration systems. • Run on FREE solar energy — OFF the grid! Tubing does not come standard with these systems except where indicated. Select models with tubing from the drop-down menu above. 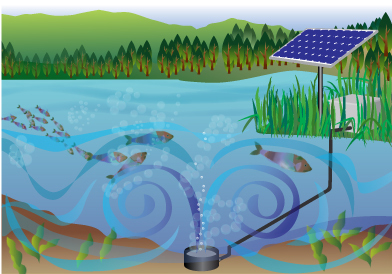 Read More » How Does the Solar Pond Aerator Work? Product Manufacturer: Keeton Industries, Inc.